In food processor, place all guacamole ingredients except mango. Cover; process with 3 or 4 on/off turns until coarsely chopped. Place in small bowl; stir in mango. Set aside. Top half of each tortilla with cheese and ham. Fold tortilla over and press down. Brush tops with oil. Heat 12-inch skillet over medium-high heat. Place 3 quesadillas, oil sides down, in skillet. Brush tops with half of remaining oil. Cook 2 to 3 minutes, turning once, until both sides are golden brown and cheese is melted. Repeat with remaining quesadillas and oil. Cut each into 4 wedges. Serve with guacamole. If you prefer, you can mash the guacamole ingredients with a fork instead of using a food processor. 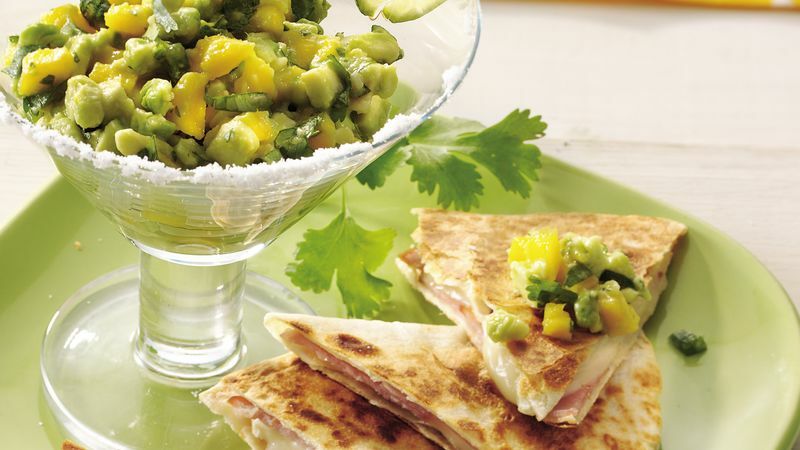 The quesadillas can be assembled, wrapped and refrigerated several hours before cooking.